Who is N'Diaga Samb ? N'Diaga Samb is a professionnal player. He is Senegalese and lives in the Netherlands. N'Diaga Samb has got a very aggressive style. He always tries to win, even when playing against the world champion. This allowed him to endanger all the best players in the world. 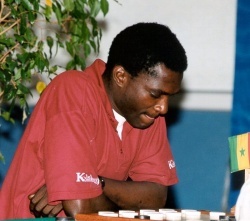 N'Diaga Samb is currently the best African draughts player. He is now world number 8. See below a selection of his best games.